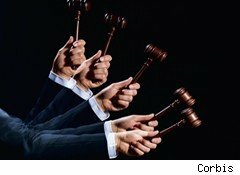 When New Jersey tightened its rules for foreclosures in response to the crisis over false loan documents, it took the unprecedented step of ordering the six largest servicers -- Ally Bank/GMAC, Bank of America (BAC), Citibank (C), JPMorgan Chase (JPM), Wells Fargo (WFC) and OneWest -- to explain why they should be allowed to continue with their foreclosures. If any of them couldn't adequately justify itself, New Jersey would suspend all the foreclosure actions by that bank in the state and appoint a special master to investigate its past and proposed processes. On Jan. 5, the banks responded, and in essence each said: Look judge, we're good guys committed to keeping people in their homes whenever possible, and while we admit that in the past we had problems -- teeny-tiny problems -- we've fixed them already. Most of the banks' briefs then argued, with varying degrees of aggressiveness, that the court doesn't have the power to impose a foreclosure moratorium or appoint a special master because that would break court rules, violate New Jersey's Constitution and the U.S. Constitution -- including the banks' due process rights -- and overstep the judiciary's role. They also claimed it was generally wrong because the banks were regulated federally. Only Chase declined to challenge the court's authority to impose the moratorium or appoint a special master. However strong these challenges to a potential moratorium and special master may be, the irony of banks arguing that halting foreclosures would break court rules and violate their due process rights is richer than New York cheesecake. After all, the banks' actions in the foreclosure process have systematically involved documents that break court rules and violate homeowners' due process rights, which is what led New Jersey to act in the first place. Irony aside, the banks are essentially saying: If you suspend our foreclosures or appoint a special master to investigate us, we'll sue to stop you. Although the banks vigorously assert that their document problems never led them to foreclose wrongly and that their records are in impeccable shape, they do admit to errors in their documents, at least to some degree. "Of the 4,023 active foreclosures in New Jersey serviced by Citi, only 613 involve affidavits that were prepared under our pre-strengthened processes -- which review is ongoing -- Citi has determined that foreclosure affidavits need to be corrected in 210 cases. Of those 210 cases, a significant percentage contained errors that were actually in the borrowers' favor." Citi's statement means that using its original procedures, at least one-third of all of its New Jersey foreclosure filings were problematic. Since Citi's review is ongoing, that percentage could rise. Moreover, if some errors were in the borrowers' favor, those errors had to be substantive, not simply a matter of perfect documents signed by someone who "technically" shouldn't have been signing them. For example, if the amount of money the homeowner is supposedly in arrears is incorrectly listed, that affects the borrower's ability to make up the default and become current. Similarly, courts might care if homeowners are told by the bank to default so they can qualify for a home loan modification, and then the bank fails to record their payments and forecloses. Finally, even if a homeowner is in default, the foreclosing company still has to have the right to foreclose. If a bank lacks the right to foreclose but forecloses anyway, big problems can result. Many recent Massachusetts homebuyers are discovering that they don't really own their homes, because the banks that foreclosed on them and then resold them didn't have the right to foreclose in the first place. That's a nightmare affecting innocent purchasers of foreclosed properties caused purely by the banks carelessness. The fact that all the borrowers were in default -- as best as the banks can tell -- doesn't mean the foreclosures were proper. OneWest and Wells Fargo were more aggressive. OneWest proudly emphasized that nationally, 98% of its affidavits in cases were accurate -- meaning that 2% were not. It also asserts that its average error was just 1% of total indebtedness. But that statistic is unhelpful in understanding the impact of the errors on individual homeowners because, by definition, some of the errors were greater than that. For example, even a small error in the amount needed to bring the loan current can prevent a homeowner from curing the default. Moreover, OneWest's accuracy boast is limited to financial information -- it doesn't address whether or not OneWest always was the bank with the right to foreclose in the case when it did. Wells Fargo was positively defiant: "Wells Fargo respectfully states that there is no basis for the Court to presume that the data in any, let alone all, the affidavits submitted by Wells Fargo are, or were, factually inaccurate." That's a very bold attitude for Wells to take, given that it has not only used robo-signers but also has failed to prove its standing to foreclose in ongoing court cases. In one Connecticut case, the judge noted that questions kept "popping out" of Wells Fargo's documents and has demanded more evidence showing Wells really has the right to foreclose. In a Texas case, a Wells Fargo employee swore in a court filing that Wells owned the loan -- until the homeowner's attorney pointed out that Freddie Mac claimed ownership, at which point the Wells person swore that Freddie owned the loan, and Wells just serviced it. Ultimately, the judge concluded Wells could not prove the homeowner owed it anything. When Wells makes its "respectful" statement to New Jersey, is it counting its affidavits and testimony in these cases as factually accurate? If not, is there some reason Wells thinks its New Jersey documents are so pristine that the court has "no basis" to question them? The banks' claims that their past document problems were very limited and technical aren't credible. And it's not just the recent news of foreclosure problems that destroys the banks' credibility: For years, foreclosure defense and bankruptcy attorneys, as well as academics, have pointed out flaws withbank foreclosure documents. All that's new -- new in the last six months or so -- is that the media has been paying attention. University of Iowa law professor Katherine M. Porter used 1,700 bankruptcy cases as the database for her seminal 2008 paper, Misbehavior and Mistake in Bankruptcy Mortgage Claims. Based on the data, she wrote: "mortgage servicers frequently do not comply with the law. . . . The bankruptcy data reinforce concerns about the overall reliability of the mortgage service industry to charge homeowners only the correct and legal amount of the debt." In her congressional testimony on Oct. 27, Porter noted that before she stopped updating her database more than a year earlier, she had identified some 50 decisions in which judges found "inappropriate foreclosure practices or misbehavior by mortgage servicers or their agents." She gave as an example a bank that had charged a debtor more than $2,000 in "penalty interest" that wasn't owed. The judge found the bank had made identical improper charges in about 50 other cases and as a result, fined the bank $95,000. Abusive servicing occurs when a servicer, either through action or inaction, obtains or attempts to obtain unwarranted fees or other costs from borrowers, engages in unfair collection practices, or through its own improper behavior or inaction causes borrowers to be more likely to go into default or have their homes foreclosed. . . . Servicing can be abusive either intentionally, when there is intent to obtain unwarranted fees, or negligently, when, for example, a servicer's records are so disorganized that borrowers are regularly charged late fees even when mortgage payments were made on time. The types of servicer abuse that my 2004 article discussed are still quite present today." Or consider the sworn testimony from a former employee of one big Florida foreclosure mill that it used inaccurate documents, including documents listing wrong amounts owed. And then there are thelawsuits against the banks and their attorneys. New Jersey separately ordered the 24 companies that have filed at least 200 foreclosure actions in the state in 2010 to show that their processes are sound. If they can't, the state will take further steps. The 24 include 22 private finance companies, Mortgage Electronic Registration System (MERS), and the New Jersey Housing and Mortgage Finance Agency. They have a few more weeks to reply to the court. So, we'll have to wait to see how effectively they defend their practices. And we'll probably have to wait longer than that to see what New Jersey does in response to the big banks' brushoff.